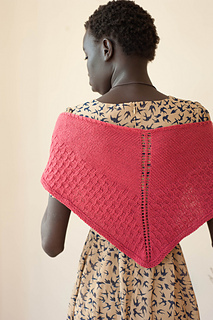 Gill’s Rock is a triangular shawlette with long tails that can be wrapped or tied. 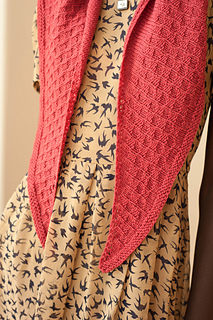 It is worked from the top down in plain stockinette stitch that changes to a simple texture pattern with slightly waving ribs. 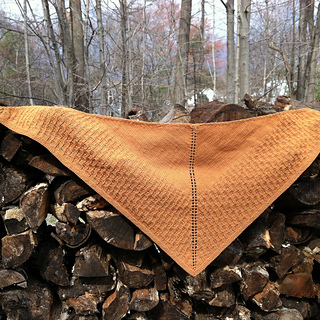 The reverse side of the shawlette is an attractive basket weave pattern. 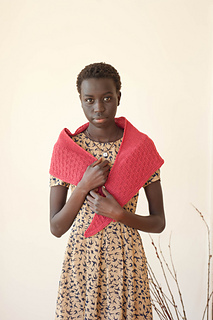 Try wearing the shawl with the point in the front and wrapping the long ends around your neck. The harbour Gill’s Rock is one of our favorite places in Door County WI. We enjoy standing on the dock to watch the sun set. The ripples on the water, the cries of the sea gulls, and the ever-changing colors of the sky at sunset are elements of perfect moments. The size of the shawlette can be altered by using a heavier yarn or simply continuing the texture pattern before beginning the border. An exact stitch count is not necessary before adding the border.